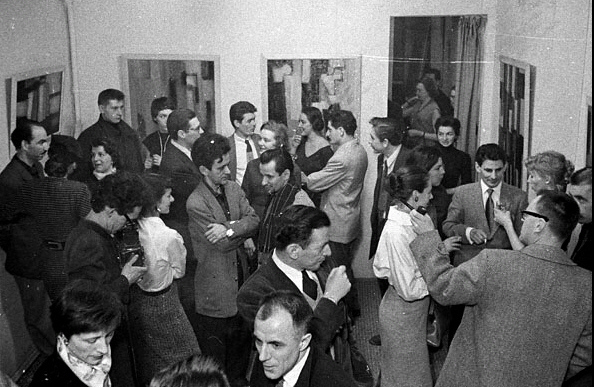 Jean-Paul Mousseau, Galerie l Actuelle, Montreal, 1956. 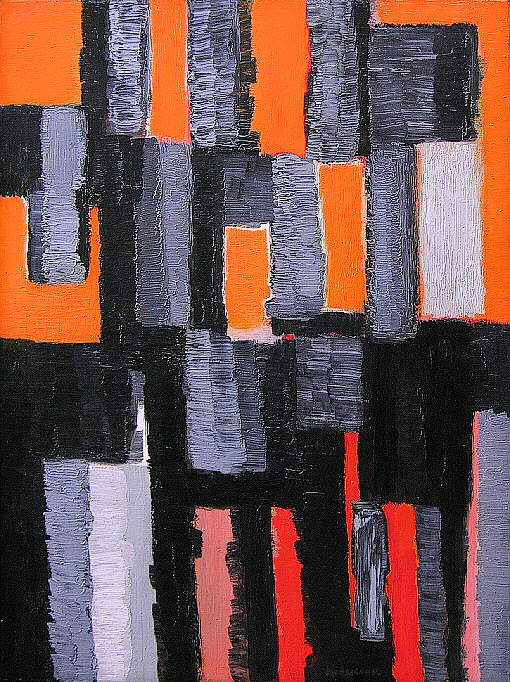 Canadian Abstract Paintings, National Gallery of Canada, Ottawa, 1956 and circulated to ten American museums by the Smithsonian Institution, Washington, D.C, 1956 – 1958. Retrospective Jean-Paul Mousseau Aspects Musee d art contemporain de Montreal, 1967. Retrospective Jean-Paul Mousseau Musee d art contemporain de Montreal,1997. Canadian Abstract Paintings, exhibition catalogue, A. H. Pope, D. Buchanan, J-R Ostiguy, 1956, no. 21. Canadian Abstract Painting Goes on Tour, J-R Ostiguy, Canadian Art Vol. 13, No. 4, 1956 p. 336-337. Jean Paul Mousseau Aspects, exhibition catalogue, Giles Henault, Musee d art contemporain, 1967. Illustrated no. 8. Un etat de la diffusion des arts visuels a Montreal, les annees cinquante, lieux et chronologie, deuxieme partie, 1955 – 1961.Sicotte, Helene, The Journal of Canadian Art History Vol. 16, No. 2 1995. Illustration, exposition Jean-Paul Mousseau, Galerie l Actuelle, Montreal, 1956, p 40. Jean-Paul Mousseau studied painting at the age of thirteen while at the College Notre-Dame in Montreal under Frere Jerome ( Jerome Paradis 1902-1944 ) in the early 1940s. He became a student at the Ecole du Meuble in Montreal during 1945 – 1946. He was introduced to Paul-Emile Borduas by Frere Jerome around the same time and became a member of the group of painters known as the Automatistes. The Automatiste group at that time was comprised of the teacher and inspirational leader of the group Paul-Emile Borduas ( 1905 – 1960 ), Marcel Barbeau ( 1925 – ), Roger Fauteux ( 1920 – ), Pierre Gauvreau ( 1922-2011 ), Fernand Leduc ( 1916- ) Jean-Paul Mousseau ( 1927-1991 ) and Jean-Paul Riopelle ( 1923 – 2002 ). April of 1946 was the first Automatiste exhibition by the group in Montreal, it was held at 1257 Rue Amherst. That same year Mousseau contributed 5 original drawings for the first Automatiste book published in Quebec, Les Sables du Reve by Therese Renaud in a limited edition of 250 copies, the text and the illustrations are inspired by Surrealism. In 1948 Mousseau was one of sixteen signatories to the Manifesto REFUS GLOBAL ( Total Refusal ) a document that was instrumental in changing Quebec society. In 1954, Mousseau created a work titled La Marseillaise, which arguably might be considered his most important painting, exhibited at 1955 Winnipeg Show a national juried exhibition, organized by the Winnipeg Art Gallery, intended to represent the highest standards of current painting in Canada. Jurors were Maxwell Bates of Calgary and Jean Ostiguy of Ottawa. La Marseillaise was awarded first prize and triggered The Great Winnipeg Controversy. Mousseau was a multidisciplinary artist creating not only paintings but photo collages, discotheque interiors, ceramics, fiber glass lighting, set designs and costumes. His public art is undoubtedly what he is best known for, the large ceramic circles in the Montreal Peel Metro station and the spectacular fibreglass mural completed in 1962, 4.57 m high by 22.86 m wide and weighing approximately 1,360 kg installed in the entrance of the headquarters of Hydro Quebec on Rene-Levesque Blvd. in Montreal. Friends and artists present include, Jean Paul Jerome, Francoise and Rodolphe de Repentigny ( Jauran ), Robert Millet, Henriette Fauteux Masse, Denyse and George Delrue, Paterson Ewen, Francoise Sullivan, Robert Blair, Claude Tousignant, Ulysse Comtois, Rita Letendre, Gilbert Langevin, Dyne and Jean Paul Mousseau, Jean and Louise McEwen. 2009 The Automatiste Revolution: Montreal 1941-1960, Varley Art Gallery, Unionville. 2009 The Automatiste Revolution: Montreal 1941-1960, Albright Knox Gallery, Buffalo. Artist biographies contain selected items only. For a more information or additional images, please contact the gallery. The images and content accessible on this site are protected under international copyright law and may not be used for any manner of publication or transmitted, in whole or in part, over communication networks without written permission from the copyright holders.